Personalised face cloth flannel in navy blue, a unique and useful gift. 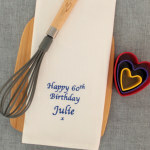 Personalised face cloth flannel in navy blue, a unique and useful gift. Popular for birthdays, sports, anniversary gifts and even a great housewarming gift. This face cloth is 100 percent soft cotton 550gsm. 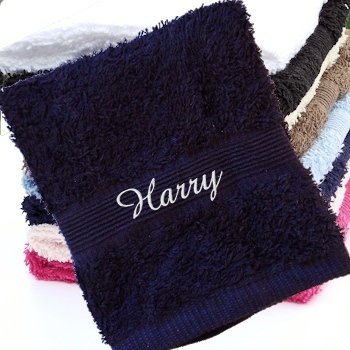 These face cloths match the personalised cotton hand towels and bath towels we also sell in the same colour, so you can create a lovely customised gift set. Fill in the option boxes with a name, nickname or initials to be monogrammed on in a thread colour and font style of your choice. Please note: Amys Gifts will embroider this gift order and do our best to get most orders dispatched within approx 48 hours.